As if it didn’t stink! The New York Daily News has built its reputation for the crass punchiness of its headlines. And this may be one of their future classics. 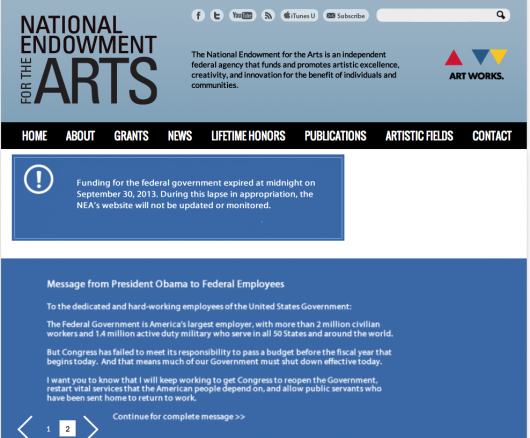 Government shut downs have no artistic or entertainment value for the people directly hit. See which agencies are open on this link from the Washington Post. Mail is being delivered. DC’s mayor Vincent Gray is using surplus monites to keep all local government agencies open on the basis that all are essential Today feels like Saturday in the nation’s capital. Traffic’s lightened up. Bars, Restaurants, and private cultural institutions are offering “shut down” specials. The AFL-CIO has put together The Federal Worker’s Guide to Shutdown DC. Eater DC is including updates. 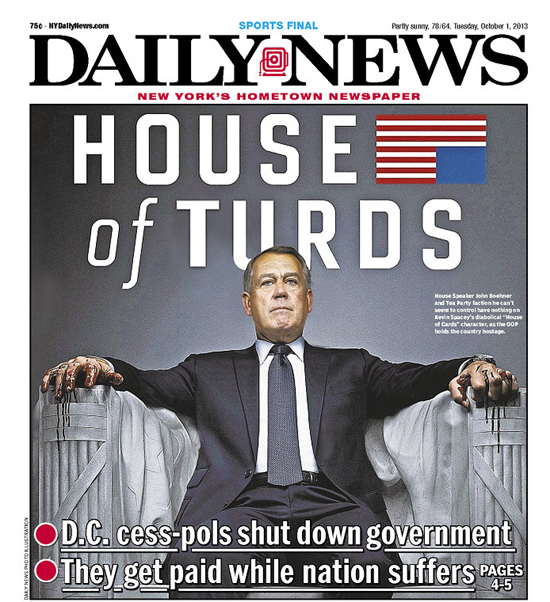 You may want to leave the New York Daily News cover home before you step out for a libation. All-in-all this is a rather stupid situation. And needs no further explanation than that. The Affordable Health Care Act marketplace site is open for business. A few technical glitches have been reported, which is also a sign that people are actually using the site. This is what the shut down is supposed to be about for Tea Party leaning Republicans. Just stupid! I’ve thrown my hands up so many times, they can’t make their way down for the punch.